File Photo: The Federal Reserve Bank of Boston's President and CEO Eric S. Rosengren speaks in New York, April 17, 2013. MONTREAL - The Federal Reserve must respond to “very tight” U.S. labor markets by gradually raising interest rates or risk halting the economic recovery, a hawkish Fed official said on Saturday. In prepared remarks that largely restated his views, Boston Fed President Eric Rosengren said he expects the labor market to improve further after U.S. unemployment dropped to 4.2 percent last month, its lowest level since 2001. 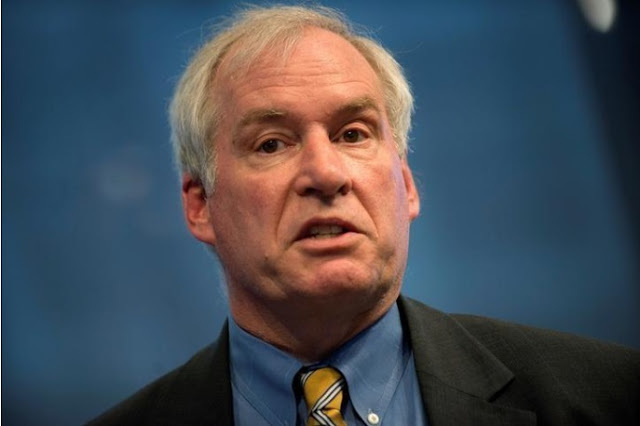 “Prudent risk management would argue for the continued gradual removal of monetary policy accommodation in order to minimize the risk of outcomes that might prematurely shorten the current economic recovery,” said Rosengren, who was speaking at the International Atlantic Economic Conference in Montreal, adding he expects the U.S. economy will likely continue to grow above its potential. “Failing to respond to very tight labor markets with rates remaining negative in real terms could potentially risk unnecessarily shortening the economic recovery,” added Rosengren, who does not vote on policy this year but whose views often portend overall Fed policy. The Fed has raised rates three times in less than a year and is expected to hike again in December. Below-target inflation has caused some more dovish Fed policymakers to want to wait. The Federal Reserve must respond to “very tight” U.S. labor markets by gradually raising interest rates or risk halting the economic recovery, a hawkish Fed official said on Saturday.